Sometimes, as an antidote to big price ticket equipment offers, I get to hear about more humble and much intriguing, simple products. The USB Disruptor was being discussed in an online forum, and I wanted to know more about this easy and addition to PC-based music playing. I read the explanation provided on the website, and could appreciate the technical argument, and decided to find out more. What I really wanted to know was: will I enjoy my music more, if I fit this to my playback system? Is it a really worthwhile and yet bargain-priced upgrade? That's what I thought when I saw this product, and the explanatory diagram on the website really piqued my curiosity. Could a simple power tweak create higher resolution in discriminating among recorded musical instruments? Just one way to find out, so I requested a sample for listening. Creator Rob Priore responded most promptly and enthusiastically, sending a sample on the next day by US Postal Service Priority Mail Express. Amazingly during the Christmas surge in mail demand, it arrived from Massachusetts, USA, to New Zealand in just a few days. On opening the package, I found personally-written documentation with encouragement to hear the improvement, along with connection instructions. I carefully followed the connection sequence instructions so that my laptop running JRiver Music Center 21 is connected through a SoTM dXUSB HD Audio Interface to my Cambridge Audio DACMagic, and the USB Disruptor powers the interface by cutting (disrupting) the supply from the PC. After 2 months of daily use including switching all system power off overnight, the connection has never failed, with the music center recognising the DAC immediately at switch on everytime. Put simply, the USB Disruptor, which is hand-built by Rob Priore, cuts the power supply from the PC USB outlet and inserts a clean supply from its mains adaptor plug. The immediate effect on sound quality of not relying on the dirty power from the PC is not to reduce audible noise, as this has not been evident. It does, however, instantly improve the resolution thus rendering a more believable soundstage with distinct instrument points discernable. My heritage of my Yorkshire homeland tells me that hype is always trumped by personal experience, so the only sure-fire way to know if this product is worth the money was to hear my music played back and to hear if I could discern a meaningful improvement in listening pleasure. This is the best way to avoid being the victim of overselling and under-performing, by which I mean overpaying for a benefit or paying for a promised benefit that isn't realised. To test the effect of adding the USB Disruptor into a USB connection between PC and DAC, designer and builder Rob Priore’s operating instructions recommend playing a Carpenters song on headphones to experience the enhancement effect. I don’t listen on headphones much at all, but on doing this headphone challenge it was immediately apparent that the soundstage was clearer and more encompassing of me as a listener, somewhat overcoming that sensation of sound coming from within my head that is most characteristic of headphones. I was able to experience with my Sennheiser HD555 headphones the improved spatial positioning of voices and instruments of the song On Top of the World. On his website, Rob Priore also recommends trying the without-with comparison when playing Soul Kitchen by The Doors. For me, the improved spatiality and airiness of the presentation is even more obvious and enjoyable. Brilliant! I see no need to tell you the detailed technicalities of the product here, since the excellent website provides clear written explanation, a clarifying diagrammatic illustration, and an engaging video presentation by Rob Priore. 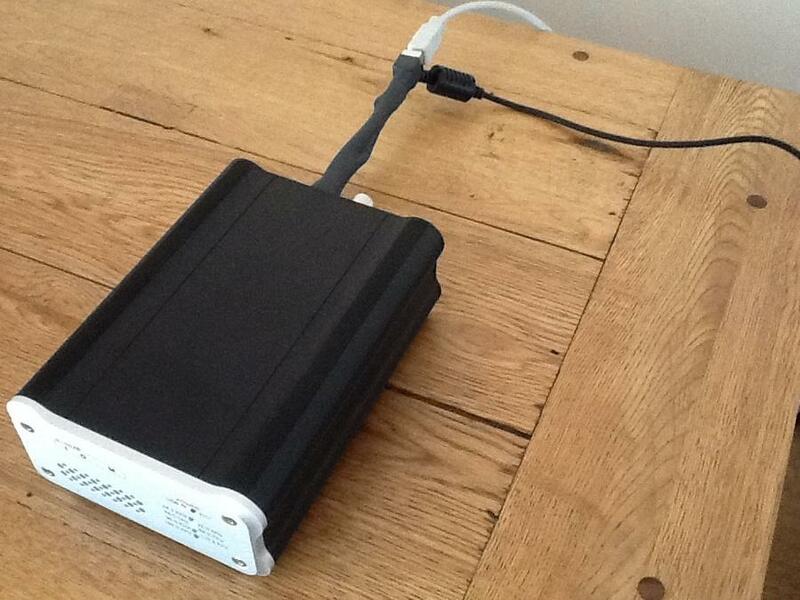 The website is very informative and well worth a thorough browsing before and after purchase of the USB Disruptor. What I will tell you is that since inserting this simple effective product into my system, I am enjoying even more engaging and enjoyable music, with the right timbre, dynamic range, and spatiality of soundstage to produce truly excellent lucidity of the music rendered. Sometimes, I feel that the digital file playback is the best musical presentation I get from my current system configuration. After running the unit in my system for several weeks, I feel there is no reason to remove it and so I continue to enjoy excellent presentation of my FLAC and WAV files. The USB Disruptor is now a permanent contributor to the pleasure I derive in listening to great recorded music.